Long Lasting Protection For Matte & Satin Finishes. Matte Paint and Satin Vinyl Wraps are a popular look and this sensitive non-gloss finish requires specialist products to protect and maintain it. Not just reserved for supercars, matte is now a cost option for Alfa Romeo (Brera), Audi, BMW Frozen, Ford (Focus RS500), Mercedes (Designo Magno), Peugeot (RCZ), Porsche and Lamborghini (Aventador). 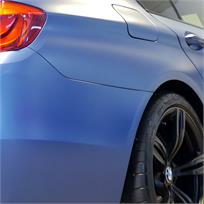 UF Matte Protection Treatment uses state of the art techniques, highly durable Ultra UV-Protective & Dirt Repellent MATTE Sealants from Nanolex to protect the delicate surface without adding gloss. Standard: Nanolex Matte Spray Sealant offering protection against chemicals, dirt, salts and oils. Pro (Single Layer): Nanolex Si3D Matte offering protection against chemicals, dirt, salts and oils, plus resistance to swirls and scratches. Pro+ (Dual Layer): Nanolex Si3D BC (base coat) plus Nanolex Si3D Matte for increased protection and enhanced hydrophobic properties.